Bruntinghtorpe & shafted, yet again! May 2006... Shafted, yet again! 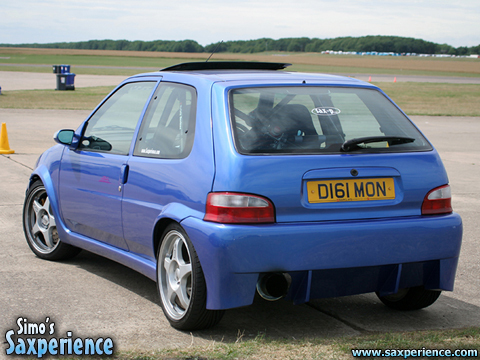 Myself and a group of Saxperience members arrived at Bruntingthorpe Proving Ground for our 3 hour track action. The session was being run as an open pit session, so we could go on and off the track as many times as we liked during the 3 hours. Every time I went out on track I took a different passenger with me... as everyone was keen to have a ride in the car! The weather had been a bit hit and miss all day, sometimes the sun would be out and other times it would be raining. We shot past the start/finish area and headed to the make-shift coned chicane. We flicked through the chicane whilst changing down to 2nd gear. 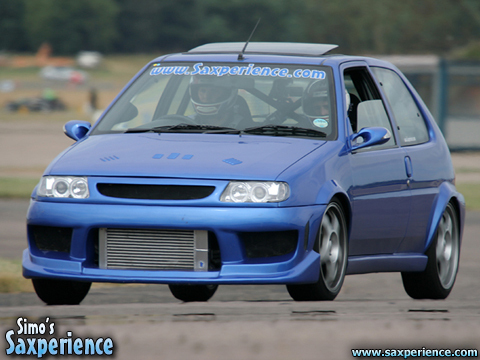 As soon as the exit to the chicane was in sight I gunned it in second gear, then changed to third... and... nothing. Nothing!?! I'd lost all transmission... we were rolling to the side of the track, unable to drive in any gear! I had visions of the gearbox exploding again... but it was only 2 days old?! The marshalls dragged (literally) the car back to the pit area so we could take a look at what the problem was. Fortunately, it turned out to be a little less severe than expected, but the damage was still bizarre! I'd managed to snap the drivers side drivesahft clean off where it entered the wheel hub! 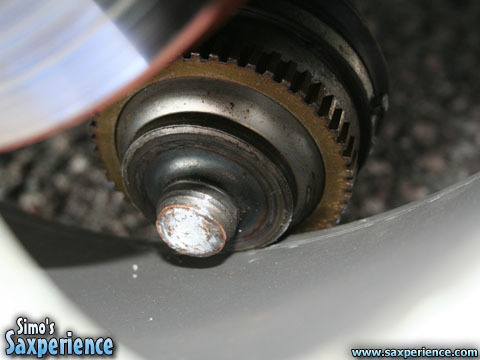 Maybe this was due to wheelspinning then grabbing traction again whilst accelerating in 2nd gear out of the chicane? The car was dead for the rest of the weekend... but I did manage to push it into position on the Saxperience show stand for the following day's show event where Saxperience managed to win second best car club of the show! So it wasn't all bad.